Fried catfish and shrimp at Mississippi Catfish. Ash Wednesday, which falls on March 1 this year, marks the beginning of Lent. For Christians, the forty-day religious observance has different emphasis and meaning depending on what denomination of Christianity a person belongs to — and how Christian they are. But for more than half a million East Bay Catholics (and many more former Catholics), Fridays during Lent mean one thing: fish and chips. Luckily, the East Bay has a wide variety of fried-seafood purveyors to keep us guilt-free for the next six Fridays. Do you want your fish and chips at a pub where Guinness and Boddingtons are always on tap and the Union Jack waves proudly? If so, you can get your fix at Kensington Circus Pub (389 Colusa Ave., Kensington). Right in the heart of tiny Kensington, a city on a hillside smack in between Albany and El Cerrito, the Circus Pub is a neighborhood bar with a British bent. The fish and chips here are very traditional: beer-battered cod that’s deep-fried until golden; fries that are a little soggy but still good; and tartar sauce, lemon, and vinegar as accompaniments. The fish and chips are good, but the vinegary coleslaw that comes on the side is the highlight of the plate. Its tartness is the perfect contrast to the fried food. Bring the whole family. The kids will love the kids’ menu, and the parents will love the many British, Irish and local beers on tap. If you’d prefer a cocktail with your fish and chips, head to Ben ‘N Nick’s (5612 College Ave, Oakland). You’ll get big pieces of surprisingly flaky and tender cod encased in a thick, crunchy batter, with a pile of French fries underneath. To drink, you could stick with a classic gin and tonic or martini, but the bar has a wide range of cocktails and a big local beer list, so you have lots of options if you want to indulge in a beverage or two while you make your way through all of those fries. Ben ‘N Nick’s can get pretty crowded, especially on Friday nights or any night when there’s a Warriors game on, but the fish and chips (and the drinks) are worth the wait. Hapuku Fish Shop (5655 College Ave, Oakland) is mostly a fish market, but on those nights when you can’t deal with cooking, you can buy cooked-to-order fish and chips right from the fishmonger. The fish is local rock cod, deep-fried with a thin panko-battered crust. It’s well seasoned and moist inside, and the lemony house-made tartar sauce pairs well with both the fish and the fries. And these are French fries to go out of your way for: crisp and golden on the outside, creamy on the inside, and a generous enough portion that you can gobble down a few handfuls on your way home and still have plenty once you get there. Fried fish comes in many styles, and there’s no reason to restrict ourselves to the British style of fish and chips. 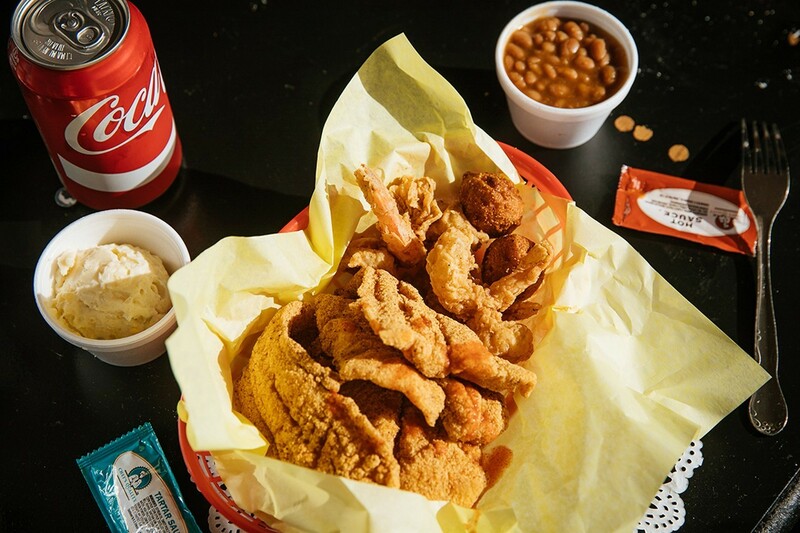 Those of us who love cornmeal-battered catfish are lucky that we have a place as good as Mississippi Catfish (12440 San Pablo Ave, Richmond) nearby. 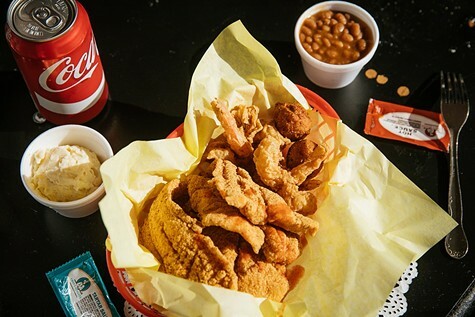 The catfish (you can also get snapper or prawns) is fried in a thin, Southern-style batter, with enough spice to pack a punch in every bite. The fries are your basic fried potatoes, but the hush puppies, which come with every order, are the best in the greater Bay Area. Get a big order to go — you can get twenty pieces of fish with a side for $50. You’ll be hailed as a hero when you walk into the party. If your version of fish and chips is fish tacos and tortilla chips, don’t fret — the East Bay’s got you covered. In Temescal, Cholita Linda (4923 Telegraph Ave, Oakland) always has fish tacos on the menu, and they’re some of the best around. For $3.50 per taco, you get big chunks of deep-fried fish topped with cabbage slaw, spicy salsa, and crema, all on top of two warm corn tortillas. And the tortilla chips are thick and well salted, and are excellent with a side order of salsa or guacamole. Okay, it’s not fish, but no discussion of deep-fried seafood is complete without mentioning Cosecha’s (907 Washington Street, Oakland) shrimp tacos. Available only on Fridays, these tacos start with huge shrimp that are individually battered and deep-fried until they’re puffy and golden. A few of those shrimp, a spicy crema, and a bed of slaw go on top of Cosecha’s handmade corn tortillas. If you get the shrimp taco special, you’ll get two of those tacos with a side of pinto beans and avocado for $15. Along with some chips and salsa, and a margarita or two, you’ve got a perfect meal for a Friday afternoon or evening — at Lent or any other time.